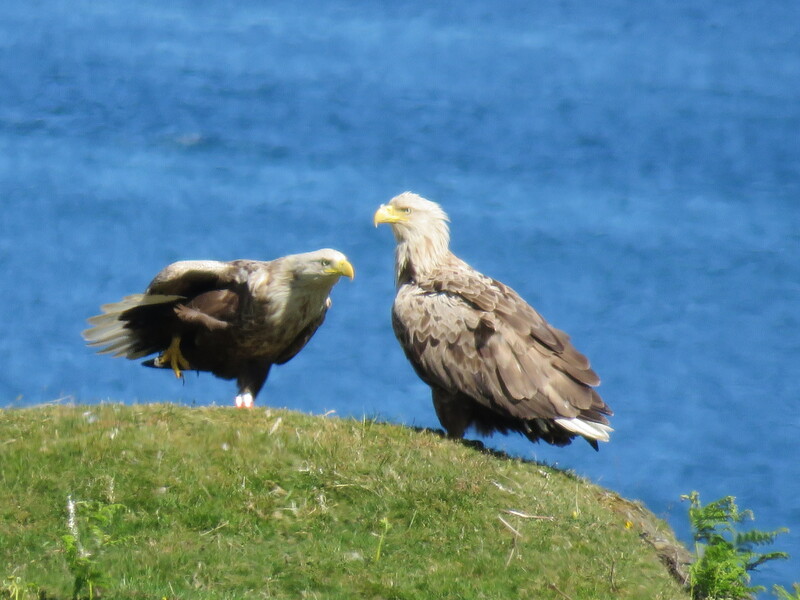 Watching Sea Eagles from the house has given us some spectacular displays this year. From watching Sea eagles mating to currently undergoing a bit of a turf war, it has been a very interesting year so far. It seems that a new pair and their juvenile are attempting to move into the area of our resident pair. Over the last week or so this has resulted in some wonderful viewings for us. At one stage we had 5 Sea Eagles all in the air. As is quite often the case our guests at the time had left to visit Iona leaving just Mike and myself here to enjoy the show. There was a degree of Talon locking and lots of calling from all the Sea Eagles until the intruders flew off towards Duart Castle leaving our pair triumphantly sitting on ‘their’ ridge vocalising very loudly to each other. We walked across the field towards Duart as the Eagles appeared to go down into the neighbouring field with a real purpose. We watched two of the three new Sea eagles sitting rather uncomfortably on the fence posts but couldn’t see the third until it flew up with what looked like the remains of a hare in it’s talons. It was closely followed by it’s mate and the juvenile. The juvenile Sea Eagle has no white tail as yet, is quite dark in its plumage and is considerably larger than its parents. Although as able a flyer as the adults it was quite ungainly when it tried to land in the top of a tree and had to make two or three attempts before it finally managed to perch safely. We have had some very special moments whilst watching Sea Eagles this year, also some of the harder side of nature too. We watched in disbelief during lambing time as one of the Sea Eagles flew in and took a new born lamb whilst the farmer was in the field checking his stock. The arrival of RSPB scarecrows (6 in all) helped a wee bit but the Sea Eagles rapidly became used to them, much quicker than we did. Flourescent orange automated scarecrows standing up every half hour or so did tend to catch the eye for a while. 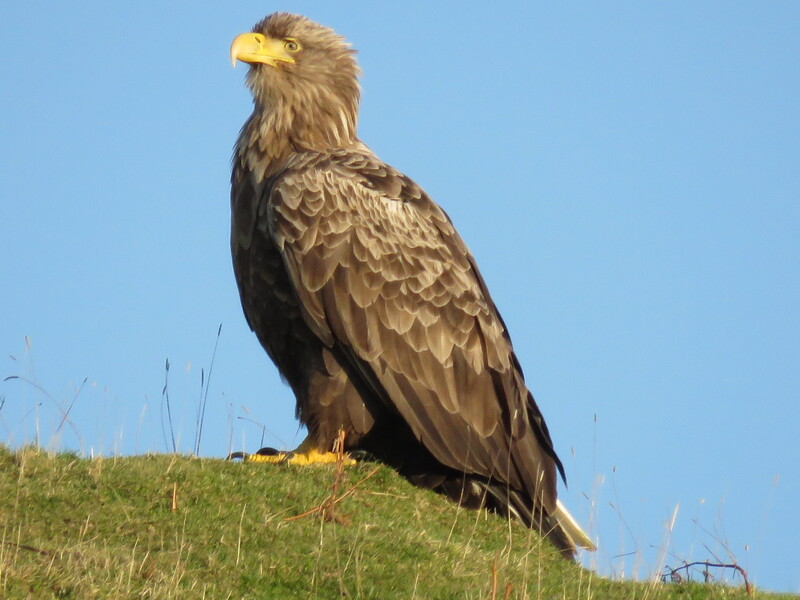 We never tire of watching Sea Eagles and truly appreciate how very lucky we are to be able to watch these magnificent birds literally from the comfort of our front room. 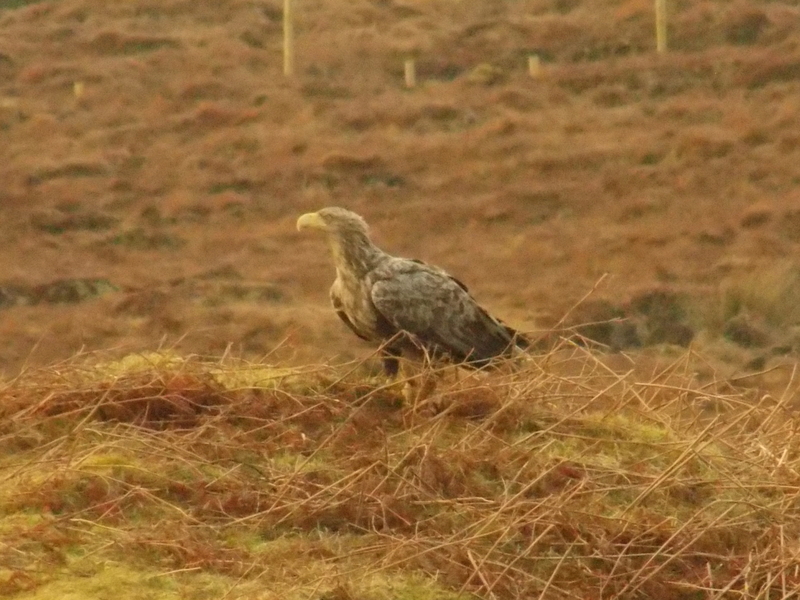 This Sea Eagle, one of a pair that has decided to nest nearby, dropped in to the mound 30 metres from the front room window. 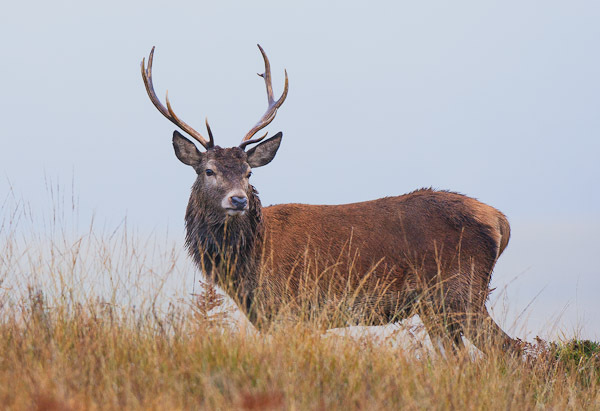 The Red Deer on Mull seem to be missing the worst of the wintery weather that is affecting most of England, however here at High Oatfield Bed & Breakfast it is very chilly outside and there is snow on the hill tops but it is yet to get down to our level.